Russian pilot cosmonaut 1963-1971. Made first Soviet space docking. Status: Inactive; Active 1963-1971. Born: 1927-12-08. Spaceflights: 3 . Total time in space: 9.91 days. Birth Place: Petropavlovsk, North Kazakhstan. Graduated from Kachinsk Military Pilot School, 1949. Graduated from Monino Military Academy, 1956. Candidate of technical sciences degree, 1972. Cosmonaut training January 1963 - 21 January 1965. Call signs: Amur (Amur - river); Granit (Granite). Succeeded Kamanin as Commander of Cosmonaut Training 1971-1987. Aide to Commander-in-Chief of the Air Force. Retired from cosmonaut-related duties in September 1991 and from active military duty 1992. Major General and pilot, Soviet Air Forces, Reserve. Family: Cosmonaut. Country: Kazakhstan, Russia. Spacecraft: Voskhod. Flights: Soyuz A-4, Voskhod 3, Voskhod 4, Soyuz 3, Soyuz 4, Soyuz s/n 15+16, Soyuz 6, Soyuz 7, Soyuz 8, Soyuz n 19, Soyuz 10. Projects: Salyut. Agency: VVS. Bibliography: 4452, 6019. 1927 December 8 - . Birth of Vladimir Aleksandrovich Shatalov - . Nation: Kazakhstan. Related Persons: Shatalov. Russian pilot cosmonaut 1963-1971. Made first Soviet space docking. 3 spaceflights, 9.9 days in space. Flew to orbit on Soyuz 4 (1969), Soyuz 8, Soyuz 10..
1964 June 23 - . Soyuz crews. - . Nation: Russia. Related Persons: Beregovoi, Rudenko, Shatalov. Program: Lunar L1. Flight: Soyuz A-1, Soyuz A-2, Soyuz s/n 3/4. Spacecraft Bus: Soyuz. Spacecraft: Soyuz A. Kamanin discusses candidates for the first five Soyuz flights. Rudenko wants Beregovoi and Shatalov named as flight commanders, but Kamanin wants the commanders to be cosmonauts with previous flight experience..
1965 January 21 - . Cosmonaut examinations completed - . Nation: Russia. Related Persons: Beregovoi, Demin, Gubarev, Keldysh, Korolev, Ponomaryova, Shatalov, Solovyova, Tyulin. The 15 cosmonaut candidates have all 'graduated' from basic cosmonaut training. The highest scores were by Beregovoi, Shatalov, Gubarev, and Demin. Two days later they officially receive their cosmonaut rating, bringing the total contingent to 34, of which 9 have already been in space. With this contingent the Soviet Union will fly to the moon and man an orbital station. That is insufficient - Kamanin wants a 40-man second contingent. The new contingent will have to be absolutely healthy male specimens, no older than 32 years, under 175 cm in height and 75 kg in weight. Keldysh, Korolev, and Tyulin are against further female flights in space, despite Kamanin's insistence. 1965 March 8 - . Voskhod-2 departure - . Nation: Russia. Related Persons: Artyukhin, Beregovoi, Demin, Ivanov, I, Katys, Shatalov, Volynov, Voskresensky, Yaroshenko. Program: Voskhod. Flight: Voskhod 3. Spacecraft Bus: Vostok. Spacecraft: Voskhod. The cosmonauts and VVS contingent prepare to depart to Baikonur - altogether 50 people on a single An-10 flight. Kamanin has started training a group of cosmonauts for the 15-day Voskhod-3 mission: Volynov, Beregovoi, Shatalov, Demin, and Artyukhin. Katys briefs Kamanin on his work together with Equipment Institute of the Academy of Sciences in preparing scientific experiments to be conducted on the next flight. Later Kamanin talks with his superiors about three candidates for future physician-cosmonaut missions. Voskresensky is the leading candidate. He specialises in research on the effects of zero-gravity on organisms, has published over thirty papers, and knows English. Yaroshenko is completing work on methods for conducting surgical operations in zero gravity. Ivanov conducts psychological studies on the impact of the spaceflight environment. 1965 April 13 - . Voskhod crews - . Nation: Russia. Related Persons: Artyukhin, Beregovoi, Demin, Gorbatko, Katys, Keldysh, Khrunov, Korolev, Ponomaryova, Rudenko, Shatalov, Solovyova, Vershinin, Volynov, Zaikin. Program: Voskhod. Flight: Voskhod 3, Voskhod 4, Voskhod 5, Voskhod 6. Kamanin meets with Marshall Rudenko to present his cosmonaut crew plans. For the experimental gravity flight he proposes Volynov-Katys (prime crew), Beregovoi-Demin, and Shatalov-Artyukhin (back-up crew). Rudenko wants Beregovoi's as the first crew, but Kamanin, sensing the Marshall is unsure in his position, pushes for Volynov. He then presents his plan for the next Voskhod EVA mission: Solovyova and Ponomaryova as the female prime crew, Khrunov and Gorbatko, and Zaikin as the male back-up crew. Kamanin says he already has Korolev, Keldysh, and Vershinin behind this plan. But Rudenko says he will decide this later - he has to take his daughter to the hospital. 1965 April 16 - . Voskhod female crew opposition - . Nation: Russia. Related Persons: Beregovoi, Gagarin, Ponomaryova, Shatalov, Solovyova, Tereshkova. Program: Voskhod. Flight: Voskhod 3. Spacecraft Bus: Vostok. Spacecraft: Voskhod. Gagarin and the rest of the male cosmonauts, as many as other VVS officers, are opposed to Kamanin's plan for a female Voskhod flight. The first cosmonaut group are also opposed to appointment of Beregovoi and Shatalov to flight crews. Tereshkova has lost 5 kg and looks ill, but all the doctors say she is healthy. 1965 November 26 - . Voskhod 3 arguments - . Nation: Russia. Related Persons: Beregovoi, Khrunov, Rudenko, Shatalov, Vershinin. Program: Voskhod. Flight: Voskhod 3. Spacecraft Bus: Vostok. Spacecraft: Voskhod. The argument continues over IMBP running qualification tests instead of IAKM. This will cause a 5 to 7 day delay in qualifying the system for flight. Vershinin and Rudenko later clear Kamanin's recommendation for the Voskhod 3 crew for the new 20-day fight plan: Volynov as commander, Khrunov or Gorbatko as pilot, Beregovoi and Shatalov as back-ups. Voskhod 4 (cancelled) - . Crew: Beregovoi, Katys. Backup Crew: Demin, Shatalov. Payload: Voskhod 3KV s/n 6. Nation: Russia. Program: Voskhod. Flight: Voskhod 4. Spacecraft Bus: Vostok. Spacecraft: Voskhod. Planned second long-duration 20 day Voskhod flight. Cancelled in spring 1966 after near-disaster with Voskhod 2 and death of Korolev..
1966 December 8 - . Soyuz parachute problems unresolved - . Nation: Russia. Related Persons: Beregovoi, Makarov, Mishin, Shatalov, Volkov. Program: Soyuz. Flight: Soyuz 1, Soyuz 2A. Spacecraft Bus: Soyuz. Spacecraft: Soyuz 7K-OK. The newly named crew for Soyuz s/n 7 begin zero-G training on the Tu-104 (Beregovoi, Shatalov, Volkov and Makarov). A review will be held of the SAS emergency recovery system in Vladimirovka tomorrow. VVS engineers are worried about the hydrogen peroxide venting which has burned parachute lines on two occasions. It is not believed that Soyuz s/n 1 can complete all tests to verify the systems that failed on s/n 2 before 18 December. It is clear that Mishin cannot resist the pressure from the leadership to hurry, and is cutting out pre-launch tests, with an inevitable decrease in the chances for mission success. TsNII-30 has been given until the end of December complete plans for search and recovery of returning lunar spacecraft. But Mishin and OKB-1 have not provided the necessary trajectory data for such planning. 1968 May 30 - . Soviet of the Chief Designers. - . Nation: Russia. Related Persons: Beregovoi, Feoktistov, Mishin, Shatalov, Ustinov, Volynov. Program: Soyuz. Spacecraft Bus: Soyuz. Spacecraft: Soyuz 7K-OK.
Mishin still wants to eventually conduct a 2+2 mission, but now wants the flight in August to be a 0+1 test flight. In this he is supported by Keldysh and Ustinov. He wants Feoktistov to be the pilot. Kamanin is adamantly opposed and offers him Beregovoi, Volynov, or Shatalov. 1968 October 26 - . 08:34 GMT - . Launch Site: Baikonur. Launch Complex: Baikonur LC31. LV Family: R-7. Launch Vehicle: Soyuz 11A511. Soyuz 3 - . Call Sign: Argon (Argon ). Crew: Beregovoi. Backup Crew: Shatalov, Volynov. Payload: Soyuz 7K-OK s/n 10. Mass: 6,575 kg (14,495 lb). Nation: Russia. Agency: MOM. Program: Soyuz. Class: Manned. Type: Manned spacecraft. Flight: Soyuz 3. Spacecraft Bus: Soyuz. Spacecraft: Soyuz 7K-OK. Duration: 3.95 days. Decay Date: 1968-10-30 . USAF Sat Cat: 3516 . COSPAR: 1968-094A. Apogee: 205 km (127 mi). Perigee: 183 km (113 mi). Inclination: 51.70 deg. Period: 88.30 min. Soyuz 4 launch scrubbed - . Nation: Russia. Related Persons: Mishin, Shatalov. Program: Soyuz. Flight: Soyuz 4, Soyuz 4/5. Spacecraft Bus: Soyuz. Spacecraft: Soyuz 7K-OK.
1969 January 17 - . Landing of Soyuz 4 - . Return Crew: Khrunov, Shatalov, Yeliseyev. Nation: Russia. Related Persons: Khrunov, Shatalov, Yeliseyev. Program: Soyuz. Flight: Soyuz 4, Soyuz 4/5. Cosmonauts in Leningrad - . Nation: Russia. Related Persons: Shatalov. The cosmonauts tour Leningrad, visiting the sites of the October Revolution - the Battleship Aurora, Winter Palace, etc. Except for Shatalov and Kamanin, none had ever been there before. They also visited subcontractor premises and military units involved in the space programme. 1969 December 30 - . Soyuz 9 planned - Belyayev seriously ill. - . Nation: Russia. Related Persons: Belyayev, Grechko, Kolodin, Mishin, Nikolayev, Sevastyanov, Shatalov. Program: Soyuz. Flight: Soyuz 9. Spacecraft Bus: Soyuz. Spacecraft: Soyuz 7K-OK. The leadership suddenly announces that a solo Soyuz mission of 17 to 20 days is to be flown for Lenin's 100th birthday (April 22). This will seize the space endurance record from the Americans and provide biomedical information for the DOS station, to be flown by the end of the year. Nikolayev and Sevastyanov are being pushed for the job. Kamanin objects, he would prefer Kolodin or Grechko, but Mishin won't hear of it. During December Kamanin, the Shatalov Soyuz 7 crew, Sevastyanov, and their wives vacation at Sochi on the Black Sea. Meanwhile Belyayev becomes serious ill. Surgeons operate to remove 2/3 of his stomach, part of his long intestine, and his appendix. 1970 May 5 - . Tereshkova promoted to colonel. - . Nation: Russia. 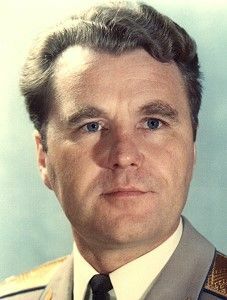 Related Persons: Kutakhov, Shatalov, Tereshkova. Kamanin notes that on 30 April decree number 0635 of the Ministry of Defence promoted Tereshkova to Colonel. She has risen in rank from Lieutenant to Colonel in only eight years, a record result for a woman (it normally takes more than ten years). Many within the VVS opposed the promotion, but Kamanin feels she deserves it and has served her country well on the Committee of Soviet Women. Later Kamanin has a filmed interview as part of a Riabchikov television project. Shatalov's trip to Cuba has proceeded well - he met Castro several times. Kutakhov is in the hospital. 1970 June 2 - . Soyuz 9 Day 2 - . Nation: Russia. Related Persons: Nikolayev, Sevastyanov, Shatalov, Tereshkova. Program: Soyuz. Flight: Soyuz 9. Spacecraft Bus: Soyuz. Spacecraft: Soyuz 7K-OK.
At 09:00 the State Commission members and 36 military officers board an aircraft to return to Moscow. Kamanin, the Soyuz 9 back-up crews, Kuznetsov, Shatalov, and 14 other officers board an Il-18 for the flight to mission control at Yevpatoriya. Conversation aboard the flight is about the weather, football - nothing about space. After four hours the plane arrives at Saki. The first communications session with Soyuz 9 is with Issuriysk at 15:40. In a three-minute conversation the crew confirms that all is normal. At 19:00 the first of the daily landing commission meetings takes place. This commission's role is to assess the flight status and to establish contingency plans for the next day in case an emergency return to earth is required. In the evening Kamanin calls Tereshkova, and promises to tell Nikolayev that she and Aleuka were fine, worried, to kiss him, and the looked forward to meeting him on his return. On 8 June Aleuka will be six years old, and Tereshkova would like to fly to Yevpatoriya to give her a surprise communications session with her father. At 21:25 Kamanin relays the news from his family to Nikolayev during a pass over Yevpatoriya. Kamanin observes that the tracking station is not suited to serve as mission control over a long spaceflight. There is no transport, and no recreational facilities. The only diversions are gymnastics, chess, and billiards. Furthermore there seem to be a lot of unnecessary staff at the command point. 1970 June 11 - . Soyuz 9 Day 11 - . Nation: Russia. Related Persons: Bykovsky, Gorbatko, Nikolayev, Sevastyanov, Shatalov, Yeliseyev. Program: Soyuz, Salyut. Flight: Soyuz 9. Spacecraft Bus: Almaz. Spacecraft: Salyut 1. Things are proceeding normally aboard Soyuz 9. Shatalov and Yeliseyev prepare to depart for the Crimea to train for use of the big solar and stellar telescopes planned for the DOS station. The 15-20 day course will be attended by all 12 DOS cosmonauts. The training plan for DOS is discussed, with a May 1971 flight date as the objective. Kamanin discusses smoking with Bykovsky and Gorbatko - they have to stop. 1970 June 12 - . Soyuz 9 Day 12 - . Nation: Russia. Related Persons: Nikolayev, Sevastyanov, Shatalov. Program: Soyuz. Flight: Soyuz 9. Shatalov departs from Yevpatoriya for Leningrad at 14:35 - his father has died..
1970 November 9 - . Cosmonauts have perfect flight safety record since Gagarin's crash. - . Nation: Russia. Related Persons: Shatalov, Yeliseyev. The cosmonaut's Seregin Regiment has now flown 4500 hours without an accident. The safety record for the VVS was 18,000 hours between crashes in 1969, 22,000 in 1970 so far..
Shatalov comes to leadership attention after good work on Pompidou visit. - . Nation: Russia. Related Persons: Shatalov. The leadership wants to appoint Shatalov as a space adviser to the General Staff. Kamanin wants him as Deputy Commander of TsPK..
1971 March 31 - . Cosmonaut delegates to Communist Party Congress. - . Nation: Russia. Related Persons: Beregovoi, Nikolayev, Shatalov, Tereshkova, Yeliseyev. The Communist Party Congress is addressed for five hours by Brezhnev. There are 5,000 delegates, including 101 international delegations from 90 countries. Brezhnev promises that the imperialist lackeys will be wiped out one by one until communism triumphs over the whole planet. Five cosmonauts are delegates - Nikolayev, Beregovoi, Shatalov, Yeliseyev, and Tereshkova. 1971 April 16 - . Soyuz 10 closed out. - . Nation: Russia. Related Persons: Rukavishnikov, Shatalov, Yeliseyev. Program: Salyut. Flight: Soyuz 10. Soyuz s/n 31 is completed. The crew are given a final look at it in the afternoon. They spend four hours in the powered-down spacecraft. Kamanin notes that Nikolayev and Sevastyanov do not look out after their physical condition even on the ground -- no wonder they were so sick after their flight! Afterwards all three crews go to the sauna together. 1971 April 17 - . Soyuz 10 crew preparations. - . Nation: Russia. Related Persons: Rukavishnikov, Shatalov, Yeliseyev. Program: Salyut. Flight: Soyuz 10. The day dawns warm at Baikonur (7 deg C at 7 am). The cosmonauts' morning is spent in a review of the space station's guidance and control systems. In the afternoon there is a briefing by officers of IAKM-VVS on use of the vacuum facility 'Polinom' during the flight. The cosmonauts are against use of the device. 1971 April 22 - . Launch of Soyuz 10? - . Nation: Russia. Related Persons: Rukavishnikov, Shatalov, Yeliseyev. Program: Salyut. Flight: Soyuz 10. nearly scrubbed due to weather.?.. 1971 April 23 - . Soyuz 10 docking failure. - . Nation: Russia. Related Persons: Mishin, Rukavishnikov, Shatalov, Yeliseyev. Program: Salyut. Flight: Soyuz 10. Spacecraft Bus: Almaz. Spacecraft: Salyut 1. 1971 April 24 - . Landing of Soyuz 10 - . Return Crew: Rukavishnikov, Shatalov, Yeliseyev. Nation: Russia. Related Persons: Chertok, Mishin, Rukavishnikov, Shatalov, Yeliseyev. Program: Salyut. Flight: Soyuz 10. Spacecraft Bus: Soyuz. Spacecraft: Soyuz 7KT-OK.